The 10 Best Places for Mac & Cheese in New York! Creamy, savory, crispy, mouth-watering… however you like your macaroni and cheese, there’s a restaurant in New York crafting it to perfection. This simple American staple has grown to include unique flavors and unique ingredients at the eateries across the Empire State. 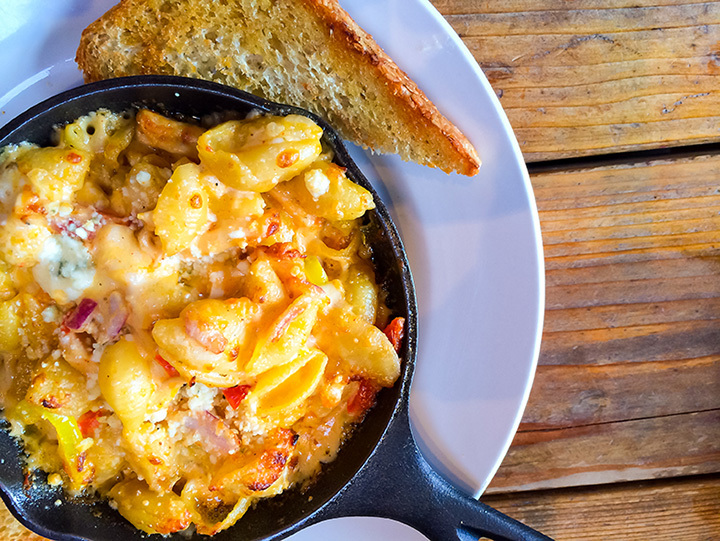 Here are 10 places with amazing macaroni and cheese in New York! The classic version of the macaroni and cheese at Beecher’s is crafted with melty cheddar, gruyere, and jack cheeses and cream. Downstairs in the Cellar, mac and cheese is dressed up with pork belly, breadcrumbs, and veggies. Just a few doors down from the iconic Murray’s Cheese Shop is this buzzing cheese bar, which channels the expertise behind the cheese purveyor into an assortment of cheesy pub favorites. The mac and cheese dish, made with a blend of four cheeses, is a fan favorite. This East Village restaurant does one thing, and they do it well—make incredible, melt-in-your-mouth macaroni and cheese. The menu contains multiple creative takes on the comfort-food classic, including Alpine (made with Swiss and bacon), Napoletana (with mozzarella, tomatoes, and basil), and Cheeseburger (you guessed it). Although Dino’s macaroni and cheese is merely a side dish, according to many, it deserves to be front and center at this barbecue joint. Creamy, savory, and cheesy, it’s attracted a fan following of its own. One of the best mac and cheeses n Buffalo can actually be found in a food truck on the UB campus. The Big Blue doles out savory macaroni with white cheddar and Panko breadcrumbs, among other varieties, in a to-go box for easy eating between classes. Mooney’s takes macaroni and cheese creation seriously. It even has its own section on the menu—and the website! Take your pic from 16 flavors and a variety of sizes, from munchkin-size to Mac Packs, which serve up to eight people. A self-described “soul food paradise,” Pepe’s Place in New Rochelle masterfully blends culinary influences from around the world in its cuisine, resulting in dynamite combinations like Tahitian vanilla bean yams and aged cheddar mac and cheese. Druther’s Brewing has won the capital region’s Mac-n-Cheese Bowl event two years in a row, stealing the hearts of both judges and patrons. The secret to their success is unknown, but it probably has something to do with the seven cheeses, shell pasta, crumbled chops, chicken, bacon, and ranch that goes into the dish. Westville is known for its impressive, upscale takes on diner fare, and its smoky mac and cheese dish is no exception. Made with ultra-creamy Gouda and cooked to a slight crisp (only the top layer), this dish has mac-and-cheese enthusiasts swooning. Rich and savory, the mac and cheese at the Smith has caught the attention of nearly anyone who’s tasted it. Although it’s listed as a side, the sheer amount of buzz surrounding The Smith’s mac and cheese warrants an upgrade to menu-front-and-center. Want to know what’s NEW & POPULAR?! Find the newest and most popular restaurants using the Wine n Dine App POPULAR tag in our Search feature! Today, this Mac n Cheese wins the popularity contest @thesmithrestaurant 🤤 #winendineapproved 📸: @LeDzEaT on Wine n Dine!